Pop Quiz! - Poetic License to Kill. OK, pop quiz time. Please define "patriot". Those look foul! Also where is the blue? 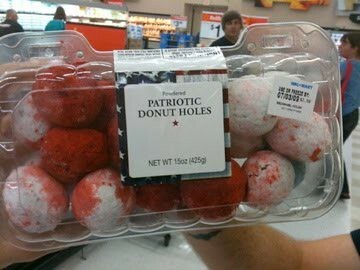 Clearly you're a "patriot" if you buy those holes. I love Cake Wrecks. Such a great blog. I love cakewrecks. They are doing a book tour right now. They had a stop at powell's last night but I was too lazy to go. fats and blood! fats and blood! I think you win the prize for best definition of patriot. "Fats and blood." Pretty restrictive to the American right, though.